Here is a quick tech trick for quickly posting your homework key (or any document that doesn’t need to be editable). Because of my new homework policy, I’ve been posting my homework key on the classroom website on the day that I give the assignment out. This allows the students to check their answers (and work) at home. Complete the key with paper and pencil. I could technically do the key on the computer, but anything that requires even a little bit algebra is a nightmare to do with software. So the best hardware in this case is a pentel quicker clicker (0.5 mm for those asking, only a troglobite would use a 0.7 pencil). Take a picture of the key with Genius Scan+ on my iPhone. This software allows you to crop, convert to black and white (looks nice), and upload to dropbox. Upload image from iPhone to dropbox’s public folder. Go on computer to dropbox.com, copy public link for the picture. Paste link to public image on classroom website. It seems like a somewhat complicated procedure, but steps 2-5 take about 2 minutes and this has been efficient enough to ensure that I’ve probably posted 90% of the homework keys online. For me, that’s pretty good. If it’s not an easy enough process, then I won’t do it consistently. Some kids have said that they do look online for the homework key and on the end of the year survey I’ll find out how many have used the classroom webpage to find the homework key. Do any of you have any ideas on how to further streamline the process? I love posts like this—practical things that could really save a lot of time without much effort. Keep them coming. I have an Android phone, not a iPhone, so this might be different. I have the WordPress app installed on my phone, so I can share the picture directly to my wordpress blog. This would cut out a couple of steps for you and would make things a bit simpler. Not much simpler, just a bit! Yea, wordpress has an iPhone app too. Unfortunately my classroom webpage is through google sites, it has some pros, but uploading pics is not easy. 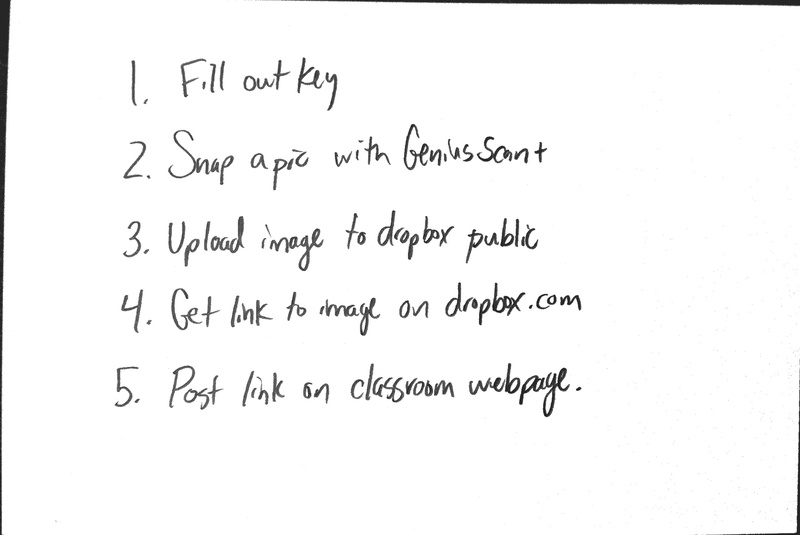 The geniusscan+ app also allows you to upload to google docs, which could work instead of dropbox. You’re right though, that route is much shorter. Thanks for the tip!